A stir is beginning to develop regarding a claim made by a team of Chinese and Turkey evangelists that they have found Noah's Ark. "It's not 100 percent that it is Noah's Ark but we think it is 99.9 percent that this is it," Yeung Wing-cheung, a Hong Kong documentary filmmaker and a member of Noah Ark's Ministries International(NAMI) team of 15. For those interested, you can read the entire story here. I also recommend visiting NAMI's website for detailed look at the claims. Now, why do I draw attention to this claim? Some may pre-suppose that I have already concluded that the Ark itself has been found and that we must proclaim it to the world. However, my intent in this post is quite different. It is my conviction that we, as followers of Christ, must be careful with such claims and practice discernment. Since becoming a follower of Christ there have been numerous archaeological finds that I have read about that have encouraged me in my faith. However, there have also been those claims that have proven to be false, but yet still seem to survive, especially on the Internet, as actual. Christianity, of course, is not alone in such false claims, especially when one recalls such claims from the scientific community as Piltdown Man or, even more recently, the "missing link" Ida. We must be careful to weigh the evidence for such lofty claims before endorsing them as fact. So, how should the follower of Christ respond to the recent claims that Noah's Ark has been found? There is nothing wrong with allowing yourself to be excited about the recent claims. I myself find the story fascinating; however, we must be careful to shift through the facts and no allow our enthusiasm to distort our conclusions. If it turns out not to be Noah's Ark, don't be discouraged. Our faith should not rise or fall on one archaeological find or mistake. Further, do not be so quick to overlook the numerous archaeological finds that have served to sustain the existence of key biblical figures and places. Don't be surprised that even if it is the Ark, skeptics will still say, "Well, that doesn't really prove anything!" Remember, it was Jesus who taught, "If they do not listen to Moses and the Prophets, they will not be convinced even if someone rises from the dead" (Luke 16:31, NIV; Emphasis mine). Sometimes, no matter what evidence is presented, the skeptic will reject it. As the story continues to unfold, remember: "But examine everything carefully; hold fast to that which is good;" (1 Thess. 5:21). Video: Jesus: Man, Messiah, or More? New Testament Scholar Craig A. Evans is just one of the numerous scholars featured in this 8 part video that chronicles their search to unearth the evidence for the Jesus Christ of history. The 8 part-DVD is available for purchase here. 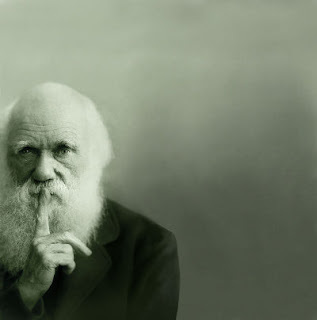 Let me start off by saying that as a follow of Jesus Christ, Darwinism and the evidence for it, does not scare me in the least. Even if evolution were proven to be true, it would not logically follow that the Christian God does not exist. That being said, a common phrase repeated by advocates of Darwinian evolution is Dobzhansky's claim that "nothing in biology makes sense except in the light of evolution." With that in mind, does the following information seem, um... thought-provoking to anyone other than myself? With this information in mind, does that mean that the men who pioneered most of the fundamental disciplines in modern biology could not "make sense" of it? 1. Jonathan Wells, The Politically Incorrect Guide to Darwinism and Intelligent Design, p. 77. Have you ever felt that God just doesn't make sense? Perhaps you were sure He would come through in a certain situation, only to be disappointed later. Or maybe you lost a love one seemingly before it was their time. As apologist Ravi Zacharias explains in this two-part sermon entitled Mind the Gaps, sometimes there appears to be a serious gap between our human knowledge and God's infinite purposes. Many times, His ways are not our ways and it's difficult for us to understand. 2. anyone who has ever felt disappointed when God seemingly didn't answer your prayer the way you thought He should. 3. someone who has lost someone they love. 4. anyone who wants to be reminded of the truth found in Romans 8:28. For more resources by Dr. Zacharias and the RZIM team, click here. For those interested, here is my essay, featured today on Apologetics315, entitled The Cumulative Case for Christianity. Thus far, the essays have been excellent and I am grateful to be included in the project. Please visit Apologetics315 and check out all the essays. 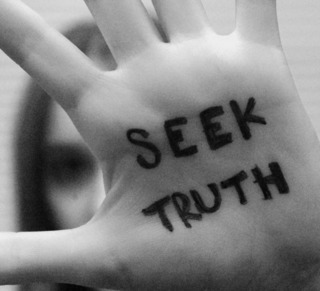 Apologetics315 has been hosting an essay series entitled Is Christianity True? This is "a series of 23 essays contributed by various apologetics bloggers from across the web. 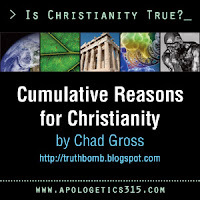 This series responds to the question: Why is Christianity True?" April 2: Tawa Anderson - Does God Exist? The essays in the series thus far have been excellent. I encourage our readers to follow this series and join the interactions! Thanks to Brian at Apologetics315 for the opportunity! To further familiarize yourself with Koukl's work, see Stand to Reason's website here. Lots of great articles and audio here. I wanted to wish everyone a happy Resurrection Day! For those who are looking for some resources dealing with the historicity of the resurrection, please see this post we did a few months back entitled Resurrection Research Links. This post features articles, audio, debates, and videos of top scholars such as William Lane Craig, Mike Licona, Gary Habermas, and more!